Would you like to bet on whether Chinese leader Xi Jinping will get reelected? Or on how profitable the 2019 Ecuadorian coffee bean harvest will be? How about betting on whether Elon Musk will ever reach Mars? Even though most realize that luck won’t make you rich, we still very much enjoy to try and beat the odds. According to a 2016 study, the global online gambling industry will touch $1 trillion around the year 2021. That’s a lot of money getting washed on hedonistic pleasures, but our bad habit can also be used for good. When asking the right questions, gambling actually provides a way to produce valuable information if you let people bet on real world events. This is what prediction markets enable, and they’re becoming decentralized. The first prediction markets were political future markets through which investors could bet on election outcomes. They date back to 16th Century Italy, and have been popping up in many Western countries ever since. Slowly came the realization that these prediction markets could be used for betting on other real-world future events, such as the stock market, the value of gold, and even the movie industry. The total sum of opinions followed by investments turned out to provide very accurate forecasts, thus very valuable information. Moreover, prediction markets provided investors with a highly convenient tool for hedging against risk. For example, an Indonesian furniture exporter has limited means to protect himself from the risk of natural disasters such as forest fires that affect his business. However, if he were to open an event ticket for a forest fire happening in the coming season and he takes a position in the “yes” outcome, he can recoup some of his losses if a forest fire were to occur. This hedging logic can be applied to a plethora of real-world events. These useful data points are illustrated, for example, by the Hollywood Stock Exchange, which is a prediction market for anything movie-related. In 1996, 7 out of the 8 top category winners of the Oscars were correctly predicted. In the US, strict gambling laws prohibit prediction markets that deal with real money. Exceptions are Iowa Electronic Markets and New Zealand-based PredictIt, which are affiliated with universities and received a no-action letter so that they could continue operating. Other legal prediction markets focus primarily on gambling on sports and gambling games, such as Betfair, BETDAQ, and Smarkets. When someone places a bet on a prediction market, that person really buys a share that represents their expected outcome. For example, if there were to be a ticket made for the event of Bitcoin hitting 10k before September 1, you either buy a “yes” or a “no” share. The shares can be freely traded on the prediction market and their percentage value represents the market’s sentiment about the probability of outcome. The share value is expressed in percentages and starts at 50%/50%. People that believe Bitcoin will go over 10k buy “yes” shares, which slowly changes the share value. As more people expect Bitcoin to go over 10k than not, the share value of “yes” exceeds that of “no.” If the share value of “yes” is 73%, this means that 73% of the market chose that outcome (based on their capital input). This also means that you can pick up “no” shares at 27%. If Bitcoin turns out not to hit 10k before September, you can redeem the “no” shares with the market maker for $1 each, thus $0.73 per share, while the “yes” shares become worthless. Binary markets have two outcome options (Yes/No). Scalar markets (range of values) have a range of outcomes. For example: what will be the market cap of Apple on December 31, 2018? Categorical markets have multiple options. For example: which cryptocurrency will grow the most over the next 6 months (Bitcoin, Ethereum, Litecoin, etc.)? 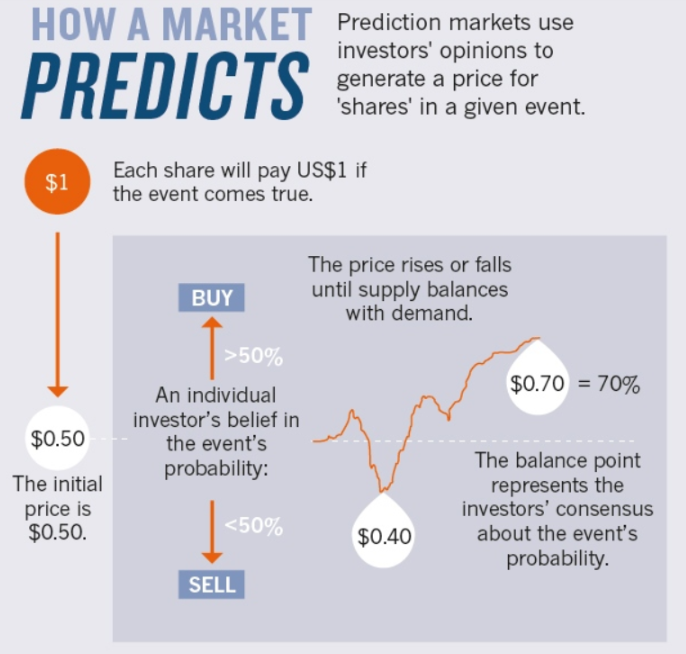 The share price of prediction market tickets is supply and demand guided by information. The information an individual has access to is only a fraction of the total knowledge available, but the access to information of the entire market is expected to be a fair representation of the sum of its knowledge. This is why the forecasts of prediction markets are so valuable. This collective knowledge is called wisdom of the crowd, which is the idea that large groups of people come to more accurate forecasts than individuals or even small groups of experts. The information prediction markets produce is just that, only even better because there is a financial gain to be made. People want to make money through betting on an outcome and are thus expected to seriously inform themselves before putting their money on the line. The forecasts created by prediction markets provide valuable insights for all kinds of purposes, such as expectations about politics, trends, the outcome of sports matches, and for just about anything else that people can think of that we can bet on. Additionally, prediction markets give anyone access to profit from investment opportunities which are not publicly available, or have barriers of entry such as geographical locations, regulations, or not having the required minimum capital. For example, a Kenyan small-time investor will not have access to investing in the UK real estate market, but he could open up a ticket predicting the rising prices of that market and buy a few shares himself. The same logic goes for the price of government bonds, stock prices, index prices, or commodity prices. Prediction markets can also function as traditional financial derivatives, allowing participants to short assets and to hedge themselves against all kinds of financial events. There are some pitfalls for predictions markets. For example, an overwhelming number of prediction markets failed to correctly predict both Brexit and Trump. Experts attribute these failings to the personal conviction most people had about what should be the outcome, creating a strong bias. Moreover, experts assessed that the prediction markets became echo chambers because of the lack of diverse opinions of participants. Nonetheless, properly designed prediction markets can be a highly valuable source to capture collective knowledge and produce accurate predictions. The most valuable information is produced by prediction markets when its participants independently make decisions based on the varied sources of information each individual participant has access to. If you have a large number of participants that meet these requirements, the value of a prediction ticket reflects an accurate forecast. The requirements for the most accurate prediction markets, namely user independence and anonymity, are naturally met through decentralization. There are no central parties involved, making the process censorship-resistant and transparent for all participants. It’s no surprise then that several projects have been working on creating prediction markets on the blockchain. Because of its permissionless nature, public blockchains are truly global and anyone can access them. For a prediction market, this allows for a colorful collection of people from all kinds of different backgrounds with access to different sources of information, making the aggregated forecast they produce highly informed. Moreover, people can access these platforms anonymously, meaning they are unknown to the market. This makes it very difficult to manipulate individual actors, who can therefore come to independent decisions based upon their own personal access to information. This reduces potential biases and leads to more accurate predictions. Additionally, prediction markets on a blockchain are inherently transparent and have distributed security because of the nature of the technology. There is no corruptible central or third party and the arbitration process of the outcomes is done by randomly selected and anonymous users of the platform. This means that decentralized prediction markets can be censorship-resistant because there is no one party to exert censorship. Moreover, there are no costs for the market maker, only the costs for creating an event ticket and the transaction fees of the blockchain the market runs on. The decentralization of prediction markets can, and will, pose serious legal challenges for regulators. Most governments place prediction markets in either the category of gambling or options trading, which are both heavily regulated. Because of the decentralized nature of blockchain applications and payments in cryptocurrencies, these dapps can get around regulatory hurdles and the traditional banking system. If a prediction market is truly decentralized, there is no way to take it down. Since anyone can create an event ticket, it is a realistic possibility that the most outrageous bets on things such as terrorism, drug prices, and assassinations will be launched on the prediction markets. To demonstrate the reality of this, the first assassination markets have already popped up on Augur. This will be legally unacceptable, as this could create financial incentives for illegal activities. The platforms can be used anonymously—so, for example, a boxer could bet against himself and throw a match. It also enables easy insider trading. Similar to the Pirate Bay, such a platform could be very hard to take down. Once regulatory attention starts turning towards a decentralized prediction market, we’ll see how decentralized the platform really is and if so, how things will unravel. But before all this, we first need a decentralized prediction market that is actually live and being used. Similar to the blockchain industry as a whole, existing prediction market projects are still in their early phase. Nevertheless, they have great potential as any competition is either heavily regulated or regulated out of existence, yet prediction markets are popular platforms for users and produce valuable insights. Prediction markets are complex to create, especially decentralized ones, and the following projects all have their own unique processes. 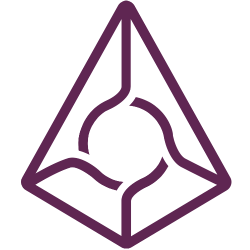 Augur has been in the making since 2014, had its ICO in 2015 and launched its platform in July 2018, signalling how difficult it is to create and launch a decentralized prediction market. The team’s vision for the platform is that it will be truly decentralized, and controlled by the community. There is no central organization that receives fees or controls any process on the platform. Augur runs on Ethereum and is therefore limited to the scalability of this blockchain for now, but it also allowed for the creation of Augur’s native ERC-20 token REP (which stands for Reputation). This token is required for creating event tickets, but also to report on the actual outcomes of events. These reporters stake REP on their submitted outcome and if correct, the reporters are rewarded with a portion of Augur’s market fees. In the case they report incorrectly, their staked REP is lost. Maker creators earn from the fees of participants in their events on Augur, so they are incentivized to create popular events. This has already been happening ever since the platform launched, with over 500 events and around $1.5 million at stake just 2 weeks after the platform’s launch. Augur is the first decentralized prediction market to launch, and is one of the most interesting dapps to watch because it’s one of the first to be actually used. However, it’s a dapp that can seriously conflict with regulations. Time will tell how the platform evolves and what obstacles it will run into, which will set a precedent for other prediction markets and dapps in general. Gnosis is quite comparable to Augur. The platform will also run on the Ethereum blockchain, and has been in development since 2015. The platform leverages blockchain technology to eliminate middleman fees and risk, and to ensure transparency and censorship resistance. Gnosis had its ICO in April 2017 during which it raised $12.5 million. The team has indicated they have a more specific focus on particular events, namely prediction markets concerning insurance, information, and financial markets. However, users of the platform are open to create a market for any event they want. Gnosis is made up of several layers that all support the platform in various ways. 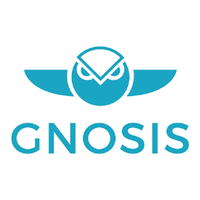 Gnosis core is the smart contract framework that enables the decentralized prediction market, the Gnosis application layer allows for both in-house as external applications to expand the platform, while the service layer allows for building applications on top of Gnosis. There are GNO tokens that are used to generate OWL tokens, which are used to pay for platform, application, and service fees. One of the key challenges for decentralized prediction markets is the verification of the outcome of events, thus putting external data on the blockchain. For this, oracles are needed, and Gnosis plans to allow external platforms to be used as oracles in some cases. If these external platforms fall short, Gnosis has the “Ultimate Oracle” solution. 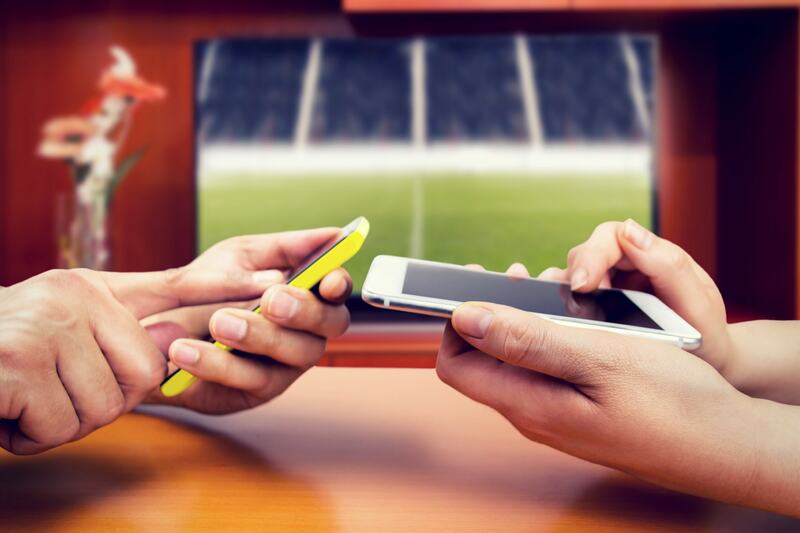 This reporting method lets users stake money on the correct outcome. If an outcome is a clear winner, the Ultimate Oracle will return the stakes plus a little to users who staked on the right outcome, while those staking on the wrong outcome lose their funds. The platform has been testing since 2017 under the name Gnosis Olympia, and several other platform layers have been launched and tested as well. The project is slowly getting its shape, and is continuously being developed and progressed by the sizeable team. A lesser-known decentralized prediction market project is Stox. The focus of this project is to bring decentralized prediction markets to the masses. The platform is designed to be easy to understand for people unfamiliar with blockchain and cryptocurrency. The team behind Stox has already successfully founded a company in 2014, invest.com, a platform on which users can trade a variety of financial products. So far, invest.com reported $50 million in revenue in 2016, and has managed to attract over 3 million users which the team wants to guide to the Stox platform. The Stox platform and token is Ethereum-based and the team leverages the existing IT infrastructure of invest.com to support the platform’s operations. 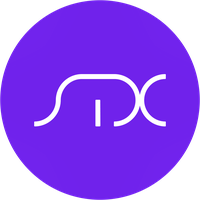 Stox’s native STX token will be used for opening events and for trading outcome shares. For oracles, trusted individuals take on the role and are paid STX by the platform for their services. Their verdict on the outcome of an event can be challenged within 24 hours of the resolution. These appeals cost STX, which will be returned to the challengers if they were right. The STX token will be used for all activity on the prediction market dapp. Stox has indicated that it will be more centralized than its competitors, which will make the platform more efficient but also requires generating trust in the centralized oracles, for example. This centralization of oracles could pose serious problems to the platform as regulations are strict when it comes to prediction markets. That being said, the platform does have a VISA and Mastercard integration for people who want to buy STX without having to go through exchanges. They also have a serious capital and consumer base from their existing, successful company invest.com. Bodhi was actually the first decentralized prediction market to officially launch. Bodhi targets the Chinese market and is the first prediction market dapp to do so. The dapp launched on the Qtum platform on the April 23, making it the first functional decentralized application on Qtum. 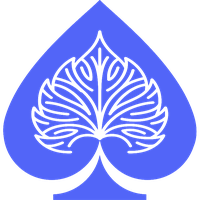 From the start, Bodhi had two versions of its dapp: the test version on which users can bet with test tokens, and the main version which allowed for real value bets. Both are live. Bodhi too allows for anyone to create event tickets on any real-world event, enabled by the absence of a central party on the platform. How this will fly in authoritative China remains to be seen, but thus far the decentralized setup of the platform has kept it online. BOT, Bodhi’s native token, can be used to access all dapp functionalities such as creating events, staking tokens on the event outcome, and participating in the decentralized dispute resolution process. Prediction markets are generally prone to strict regulations, which the decentralization might undermine. However, most dapps are still created by centralized teams with offices in countries with regulations, so as long as these prediction markets are not truly decentralized, regulatory push backs are to be expected. Nonetheless, prediction markets are valuable tools for generating accurate forecasting information based on the wisdom of the crowd, for hedging against real-world risks, and as a way for people to make informed bets instead of leaving gambling completely up to chance. Such prediction markets are scarce, and by decentralizing them, people from anywhere can have access to prediction markets and use the event markets for literally any purpose they like, which will lead to highly interesting, perhaps morally questionable event markets. 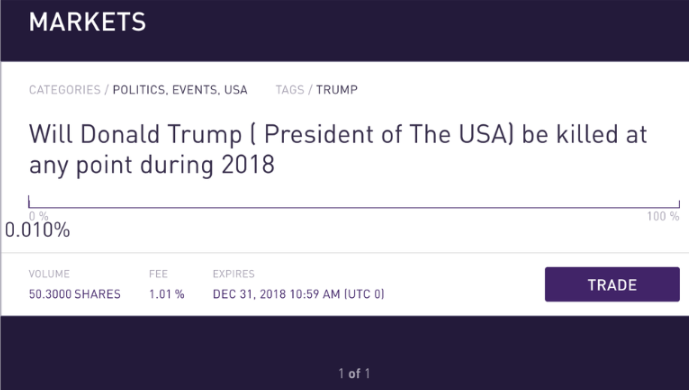 Augur’s early success already indicates that there is consumer interest in these prediction markets and is the first major step in bringing these markets for betting on future outcomes of real-world events to the masses. Right now, decentralized prediction markets seem to be heading for a battle between regulation and decentralization.